It’s quite a show here in Barcelona. Many companies announced new devices, including HTC and Samsung which — rather than hosting their own events — returned to MWC to unveil their flagship phones. This is the very-entry-level smartphone running Firefox OS 2.0. Although Alcatel hasn’t disclosed the price, we’re talking about the device that will likely cost around $50 in its unlocked form. Specs include a 1GHz dual-core processor, 256MB of RAM, 512MB of expandable storage (with microSD cards), 2-megapixel camera with LED flash, HSPA connectivity, two SIM card slots, GPS, FM radio receiver, and a 1,300 mAh battery. All this comes wrapped in a 112.2 x 62 x 11.9 mm body. Both IDOL 3 models are fully reversible, allowing users to pick them up and talk even with the top side down. The bigger model is obviously better, sporting a 5.5-inch full HD screen, Qualcomm Snapdragon 615 64-bit octa-core chip, 2GB of RAM, and 16 or 32 GB of internal storage. In addition, it also packs a 13MP main camera with f2.0 lens, 8MP selfie shooter with wide-angle lens, dual front speakers and a 2,910 mAh battery. All this comes packed in a 7.7mm-thin body. On the other hand, the OneTouch IDOL 3 (4.7) has a 4.7-inch 720p screen, 1.2GHz Snapdragon 410 chipset, 5MP front camera, and a 2,000 mAh battery. Rest of the specs are the same. The smaller model will be available for €200 while the bigger one will go for €50 more. 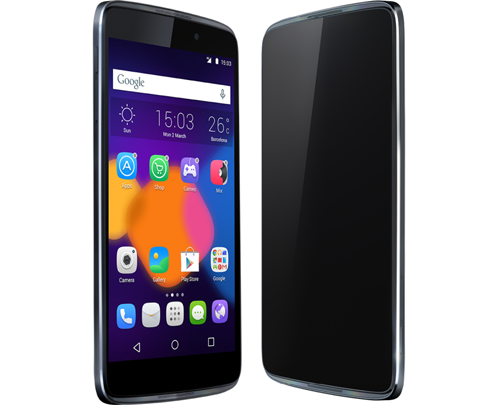 Alcatel also announced a whole series of PIXI 3-branded devices, including both smartphones and tablets. Here, we’ll be looking at two phones from the series, one with 3G and the other with 4G connectivity support. The LTE-enabled model has a better screen, growing from qHD (540×960) of the 3G variant to 720p HD resolution. Additionally, it rocks a different chipset that is slightly more powerful than the one PIXI 3 3G has. Rest of the specs are the same and include 1GB of RAM, 4 or 8 GB of expandable storage, 8-megapixel rear camera with auto-focus, 2MP front-facing camera, and all of the “standard for Android” sensors such as accelerometer, proximity, light and e-compass. Android 5.0 Lollipop is running the right from the get-go. Aside from teasing the world with its upcoming slider, BlackBerry had a single phone to announce at the big show in Barcelona. Called BlackBerry Leap, it’s an mid-end device that will find its buyers in the emerging markets of the world. It has a 5-inch HD screen, 2GB of RAM, while Qualcomm’s dated Snapdragon S4 Plus is providing the processing power to run things (smoothly?) all day long. Additionally, the Leap packs 16GB of expandable storage, and an 8-megapixel camera with auto-focus and LED flash. Size wise, it measures 144 x 72.8 x 9.5mm and weighs 170 grams. BlackBerry OS 10.3.1 is running the show out of the box; the phone will launch in April with a SIM-free price of $275. The second Blackphone device rocks an unspecified 64-bit octa-core processor that should make data encryption that much faster. It has a 5.5-inch full HD screen protected by Gorilla Glass 3, LTE radio, 3GB of RAM, 3,060 mAh battery, while PrivatOS 1.1 delivers the highest possible level of security on Android. Among the features the new version of the platform brings to the table are enhanced Spaces UI for separating different parts of Android from one another, allowing users to assigns different logins for different areas (app types) of the device. Silent Circle has priced the phone at $649. Gionee is out with another super-slim smartphone, the Elife S7, which is bursting with battery-saving technologies and software features. These include an AMOLED screen, a Dark theme, Freescale’s Sensor hub and the Extreme mode for emergencies. According to Gionee, these capabilities combines should improve battery life by up to 32%. Specs wise, the S7 has a 5.2-inch full HD display, MediaTek’s 64-bit octa-core MT6752 chipset clocked at 1.7GHz, 2GB of RAM, 16GB of built-in storage, 13MP rear camera, 8MP front-facing shooter, two SIM card slots, LTE connectivity support (some models) and a 2,750 mAh battery. The phone’s frame — what Gionee calls a U-shaped skeleton — is made out of aviation-grade alloy, featuring a stainless steel sheet with nano-molding plastic. The Gionee Elife S7 will launch in Macau on March 18th and India on April 3 with a price of €400. Users will get to choose between few color options, including Los Angeles Black, North Pole White and Maldives Blue. HTC’s latest (and greatest?) device has been unveiled in Barcelona. Some think it’s not a “proper” successor to last year’s One M8, though it’s certainly better device all time round. However, it does lack that second camera on the back, which is now replaced with a bigger 20MP sensor, protected by sapphire cover lens. The Ultrapixel camera is now placed on the front. Inside, we find Qualcomm’s powerful Snapdragon 810 64-bit octa-core chip that should deliver all the processing power a user could need. The unit packs 3GB of RAM, 32GB of expandable storage, 5-inch full HD display, HTC BoomSound with Dolby Audio 3, LTE Cat 6 connectivity support, while Android 5.0.2 Lollipop is running the show helped with HTC’s own Sense 7 UI. The HTC One M9 measures 144.6 x 69.7 x 9.61 mm, and has a weight of 157 grams. The second phone in the company’s Tornado series, the Tornado 455L comes with a 5.5-inch 720p display, 1.2GHz quad-core Snapdragon 410 chip, 2GB of RAM, 16GB of internal memory, 13MP rear camera, 5MP front shooter, LTE connectivity, IP67 certification and a 2,600mAh battery. Kazam’s latest device will be available in Europe at some point next month. Pricing is still a mystery, though. The A7000 is hardly a head turner, but it’s the first smartphone with the Dolby ATMOS surround sound feature, ever. It doesn’t have some fancy speakers though and in order to enjoy the enhanced audio quality, you’ll need to use headphones. Rest of the specs include a 5.5-inch HD screen, MediaTek’s octa-core chip clocked at 1.5GHz, 2GB of RAM, 8MP rear and 5MP front cameras, 8GB of expandable storage and a 2,900 mAh battery. The phone supports 4G LTE connectivity and has two SIM card slots to allow users to connect to two different networks at once. Lenovo will start selling the A7000 later this month, asking $170 for the unlocked, SIM-free unit. The Lenovo Vibe Shot is one of the more innovative phones unveiled in Barcelona. Although it lacks top-notch specs, it looks different from anything else; it reminds us on a classic point-and-shoot camera rather than a smartphone. The device is built around a 5-inch full HD screen; it has a 16MP camera with a six-piece modular lens, a tri-color LED flash, optical image stabilization and infrared focus. There’s also a dedicated shutter button to complete that camera look and feel. Front-facing camera has an 8-megapixel sensor. Under the hood, the Vibe Shot boasts Qualcomm’s 64-bit Snapdragon 615 SoC, 3GB of RAM, 32GB of expandable storage and a 2,900 mAh Li-Po battery. All this comes wrapped in a 7.3mm-thin case that also includes slots for two nano SIM cards. The Lenovo Vibe Shot will be launched in June when users will be able to choose between few color options, including grey, white and red. The price is set at $349. The Redmond giant used MWC to unveil its latest Windows Phones, the Lumia 640 and Lumia 640 XL. Both devices are catered toward the mid end of the market and will hardly impress anyone. Still, Microsoft should be able to move quite a few of these, and keep the ball rolling until first Windows 10 devices are out. The Lumia 640 has a 5-inch 1280 x 720, Gorilla Glass 3-protected screen, 1GB of RAM and 8GB of storage, while Qualcomm’s Snapdragon 400 provides the processing power needed to run things smoothly. The phone also sports an 8MP rear camera with LED flash that is coupled with a 1MP front-facing shooter with wide angle lens. The Lumia 640 XL, on the other hand, is a phablet with a 5.7-inch 1280 x 720 screen. It shares most of the specs with the “regular” Lumia 640 though there are some differences. For instance, it has a better, 13MP rear camera with Carl Zeiss optics and a 5MP front-facing camera. The Lumia 640 3G will start selling in April for 139 Euro, while an LTE-enabled variant will go for 20 Euro more. The Lumia 640 XL will debut later this month with a price tag of 189 Euro for the 3G version and 219 Euro for the LTE variant. Additionally, users will also be able to grab these two phones in dual-SIM variants, though we’re not sure these versions will be available all around the world. What we do know is that both the Lumia 640 and Lumia 640 XL will ship with a free copy of Office 365 Personal (worth $69.99). If you don’t got for the new HTC One M9 and you want a powerful Android device, chances are you’ll be looking at Samsung’s latest Galaxy S smartphones, the Galaxy S6 and Galaxy S6 edge. Both models are “crafted from metal and glass” to deliver a premium look and feel. Unfortunately though, this forced the Korean company to make some compromises like including a non-removable battery and dropping microSD card slot out of picture. If you can live without those things, you’ll love the Galaxy S6 and S6 edge. Specs wise, both phones rock a 5.1-inch Super AMOLED screen with Quad HD resolution (2560×1440 pixels), Samsung’s 64-bit Exynos octa-core chip, 3GB of RAM, 32-128 GB of fast UFS 2.0 internal storage, 2,550 mAh or 2,600 mAh battery (S6 edge), 16MP main camera with f1.9 aperture, 5MP front-facing shooter, NFC, heart rate sensor and improved (compared to the Galaxy S5) fingerprint sensor. The Galaxy S6 and Galaxy S6 edge will launch on April 10 with users being able to choose between few different color options such as White Pearl, Black Sapphire, Gold Platinum, Blue Topaz (Galaxy S6 only) and Green Emerald (Galaxy S6 edge only). This IP68-certified phone will keep working for up to 30 minutes in 1.5m deep fresh water. The M4 is also dust-tight and looks very much like the Xperia Z3. Specs wise, however, it’s a mid-range product with a 5.2-inch 720p HD screen, Qualcomm Snapdragon 615 chip, 2GB of RAM, 13MP rear and 5MP front cameras, LTE connectivity support, 8 or 16 GB of expandable storage. Android 5.0 Lollipop is running the show right from the get-go. The Sony Xperia M4 Aqua has a 2,400 mAh battery that should last for up to two full days of normal usage. It will be available all around the world this spring in white, black, coral and silver flavors for €299. The ZTE Grand S3 packs a 5.5-inch full HD screen, and is powered by Qualcomm’s Snapdragon 801 quad-core chip clocked at 2.5GHz. It has 3GB of RAM, 16GB of expandable storage, 16MP rear and 8MP front cameras. In addition, there’s LTE connectivity support, Dolby Sound and a rather large 3,100 mAh battery. What makes the S3 unique is the built-in eye-based biometric security via the Eyeprint ID. This tech can be used for authorizing mobile payments, unlocking the screen or accessing secure content, and — you guessed it — will also be coming to other phones and tablets in ZTE’s line-up in the near future. The ZTE Grand S3 is already available in China where it could be bought for 2999 Yuan (around €430). Right now we’re unsure of its international prospects. Not a big fan of Samsung but the s6 edge looks nice. Hope it doesn’t go back to the LG g2 where you can’t change battery or insert memory. No Sony Xperia Z4? but why? Nice information its very helpful. i want one mobile phone add to list vivo xplay 5 are also best features phone. phone screen 5.43 inch and display and runs on 5.1 android platform. according to me its best phone.